This popular indicator is similar to the older moving average envelope. It was developed by John A. Bollinger, CFA, CMT. In contrast to the moving average envelope, instead of plotting a “resistance” line some fixed percentage above a moving average and another “support” line the same fixed percentage below a moving average, Bollinger plots a resistance line two standard deviations above and a support line two standard deviations below a 20-day simple moving average. 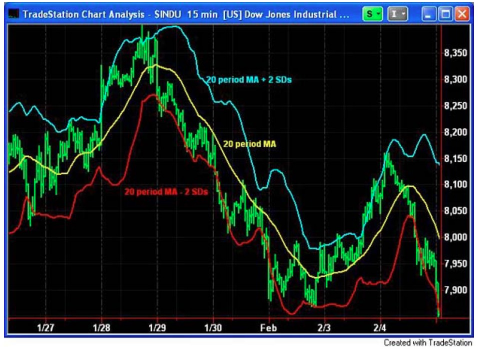 Bollinger Bands are versatile and can be adapted to any time frame, from minutes to months. They are designed to quickly react to large moves in the market, and to show whether prices are high or low relative to normal trading ranges. Bollinger uses his bands with other indicators to confirm price action. Bollinger suggests the 20-day simple moving average with plus and minus two standard deviations to be descriptive of the intermediate-term trend. These have become the most popular default settings. For analysis of the short-term trend, Bollinger suggests a 10-day simple moving average with one and a half standard deviations. For analysis of the long-term trend, Bollinger suggests a 50-day simple moving average with two and a half standard deviations. Bollinger noted that the moving average length should be descriptive of the chosen time frame, and that this moving average is almost always a different length than the one that proves the most useful for crossover buys and sells. Also, Bollinger suggests that a way to identify an appropriate moving average length is to choose one that provides support to the correction of the first move up off a bottom. If the average is penetrated by the correction, then the average is too short; and if the correction falls short of the average, then the average is too long. The moving average ought to provide support far more often than it is broken. Source: Colby, Robert. The Encyclopedia of Technical Market Indicators; (c) 2003. Source: Charts created by Bloomberg LP. All rights reserved. Click here for more information on Bloomberg.